6.98 points at 47 votes (rank 360). Rombachs C64 game guide 8 September 1984 - "Vote 2"
You have to steer your character through seven absolutely different levels. In every level new deadly perils lurk for the hero. The first is probably the most famous level. Left and right are some not exactly friendly meaning aztecs, which welcome you with spears. You either have to duck under the spear or jump over it (depending on the height the spear is coming at). If you get hit you have to start again. In the later levels you have to avoid stones, poisonous scorpions and snakes and get over a bridge. 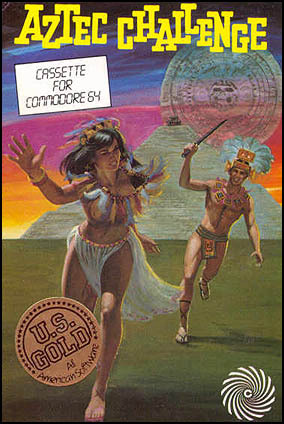 The design of the game Aztec Challenge differs in every level. Sometimes you see your character from the back, sometimes from the side or from the bird's eye view. On the first level you can see the temple approaching. In other levels the graphics are not as good. Nevertheless you can look forward to nice and fluent animations with lots of variety. The levels are accompanied by mystic sounding music. The rhythm gets faster the further you proceed in the game. The operation with the joystick differs in every level and is explained at the beginning of every level. You should read the explanations carefully to avoid getting suddenly smashed by a stone. With the RUN/STOP -key the game is started again. The game is divided into 4 phases with each 7 levels. In the version by Jack Alien/Remember there is a trainer mode, in which you can jump directly into the desired level and phase. Additionally there is the possibility to jump into the next level by pressing the Commodore key (in emulators it is the left Ctrl key). Dante "Aztec Challenge definitely offers diversity. All the levels differ strongly in the play. I also like the nice graphics. Unfortunately the level of difficulty is especially in the first level much too high. There are some levels which are considerably easier. This is frustrating and gets the game only 5 points, because the other levels are partially bad equipped with graphics." Sledgie: "This arcade game can drive you mad due to the partially long levels. A spear hits you shortly before you reach the goal and you can start again. In spite of that it is fun, also with 2 players, and offers a great number of variants of skill tests. 7 out of 10 points." Guybrush: "Aztec Challenge has many fans, I was never one of them, I don't know why, but the game was not my thing. Regarded objectively I can give 5 points." Evil Igele: "One should add that with level 6, Piranha, it was the only time you couldn't play a game on black and white TVs (which were used in the past), as you couldn't see the piranhas, no matter how the contrast was adjusted. Nevertheless 7 points from me." Borna: "I was mainly gripped by the music. The game was difficult due to the length of the levels, the required activity itself (up or down in the first level) was rather easy to perform. With hindsight it is overrated, but who cares? With classics you better not ask for rational reasons for their success. Rockford: "Is there a game that was more frustrating than Aztec Challenge? I almost can still feel the frustration in my body. But through this it probably got its motivation. Of course I also played it over and over again, some day it just had to work. One day when I had finally played it through, I was happy and reliefed and I never touched it again. By the lack of highscore here I can see that also others still have as much respect as I have for this game." Shakermaker303: "I thought the game was sinister and mystical due to the music and the title screen. All in all it is a great game, it was a lot of work until I had played it through. 9 out of 10 points I'd say." Ironman: "As a kid I had to train and cultivate my concentration level to survive the first thrilling level. But it's like cycling, years later I still have the required skills to get through the game, and I still enjoy it. Much credits to Paul Norman for the excellent and exciting music tune. 8/10"
Paul Norman wanted to realize this game also for the Atari 2600 in those times, but considered it impossible, due to technical limits. In this game you have 5 lives to finish a level. If these lives are used up you start again at the beginning of this level, but the points reached until then are not deleted. That means, that it can be played endlessly and the score rises higher and higher. Therefore a highscore doesn't make sense. This page was last modified on 20 May 2018, at 23:59.